They say you are the average of the five people you spend the most time with. Whether that’s true or not, it is undeniable that your relationships with everyone you know, from your family to your friends, from your significant others to you co-workers, help shape who you are, how you see the world, think, and behave. That’s why, to fully understand Elizabeth I, we need to look at her relationships with the people in her circle. Susan Doran’s new book does just that. It is divided in three sections. The first takes a look at Elizabeth’s complicated relationships with her family, including her father Henry VIII, her stepsister Mary I, and her Stuart cousins, Queen Mary and King James VI of Scots, which were often fraught with danger. The second part is dedicated to the courtiers most close to Elizabeth, first among all Robert Dudley, Earl of Leicester. His portrayal is very well-balanced and, while not playing down his faults, Doran doesn’t paint him as the greedy and ambitious social climber who exploited Elizabeth’s feelings for him, as many novels and movies do. Here, he comes across as a man of his time, who was determined to succeed at court but genuinely cared about the Queen. Disappointedly short is instead, the section about the women who served Elizabeth. While each male courtier (Dudley, Sir Christopher Hatton, and Robert Devereux) get their own chapter, the Queen’s women are all lumped together in the shortest chapter in the book. But this is not Doran’s fault. There just isn’t enough information about them in the historical record that survived. But it was still one of my favourite chapters as it helped squash the myth of a jealous Queen who couldn’t stand to see her women happily married and in love. When she refused them permission to marry, she always had a good reason, like the unsuitability of the suitor. The final section is reserved for the councillors, those men who helped her run the country. Sir William Cecil and his son Robert are well known, so my favourite section was the one about Sir Francis Walsingham, which helped me get a better understanding of who he really was and his often frustrating relationship with the Queen. Doran uses private letters, state papers, as well as portraits and poems, to create an engaging and compelling story full of fascinating insights into Elisabeth’s political and personal behaviour and that challenges many of the popular myths about the Queen and her relationship with those closest to her. Because each chapter focuses on a different individual, the book doesn’t follow a chronological order. I thought this would make it hard to read. But I was wrong. Doran writes clearly and avoids repetitions as much as possible. As a result, not only the book isn’t confusing in the least, but the reader gets a better understanding of the particular impact a certain relationship and event had on the Queen. 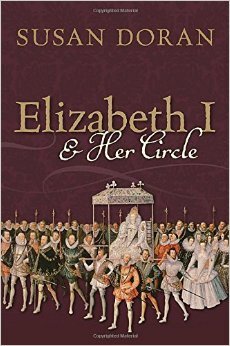 If you’re interested in the Tudors, Elizabeth I & Her Circle is a book you can’t miss. It deserves a special place in your library. Engaging and insightful, Elizabeth I & Her Circle is a must read for everyone who wants to know more about the relationships the Queen had with those closest to her and how they impacted her. Drawing evenly from original sources, the book also debunks many common myths about the Queen.